Experts say the depth of psychological damage after the fire in Paradise, California, may depend on how much help residents are getting now. It was her first glimpse of the approaching wildfire that would become the deadliest and most destructive in California history — one she continues to relive in debilitating nightmares and flashbacks. The Camp Fire virtually incinerated Paradise, a town of 27,000. It killed 85 people in the region — many of them elderly. Most died in their homes — others while fleeing in their cars or trying to flee on foot. For thousands of residents, the terror of sitting in traffic jams as the wildfire bore down left emotional scars. “Everyone who experienced this went through trauma,” said Linnea Duncan, a licensed clinical social worker who fled the fast-moving firestorm from her home in Magalia, a community just north of Paradise. For Holcomb, it took nearly three hours to escape Paradise as smoke from burning houses, cars and brush turned day to night and cut visibility to mere feet. Barely able to see the road, she got behind a large truck — its tail lights her guide. As she watched the flames devour nearly everything around her, she could hear residential propane tanks exploding like steel-encased kernels of popcorn. “You could hear, ‘Boom, boom, boom,’” she said. Just as she got out of the flames, her truck caught fire. Holcomb pulled onto the median of the highway and jumped out in time to save herself and her cat. A man she didn’t know told her to get into his truck and together they made it to safety. In the commotion, she left a backpack next to her burning truck. It contained treasures: her mother’s Bible, her grandfather’s Purple Heart medal from World War I and photographs of both of them. Nightmares and flashbacks in the immediate aftermath of a disaster are normal, said Barbara Rothbaum, director of a trauma and anxiety recovery program at Emory University School of Medicine. So too are irritability, anger, hyper-vigilance and problems with sleep and concentration. But when these symptoms persist for at least a month, the diagnosis can be post-traumatic stress disorder, or PTSD. First acknowledged by America’s mental health community in 1980, it’s the one mental health disorder predicated on exposure to traumatic events. “It’s the magnitude of a disaster that oftentimes can help us to predict how severe the mental health distress is going to be among affected populations,” said sociology professor Lori Peek, director of the Natural Hazards Center at the University of Colorado at Boulder. And in Paradise, the “magnitude of the disaster” was staggering. Paradise officials report that 9 in 10 homes burned down in this middle-to-low income town popular with retirees. “It’s been pretty traumatic,” said Elissa Crane, who lost the low-income rental she shared in Paradise with her husband and her disabled adult son. The family has been staying in an insurance-paid hotel since November as they search for an affordable apartment for themselves and their two cats. And now, with temporary housing insurance about to run out, they’re considering a permanent move to Idaho. Martha Bryant’s house was one of three remaining in a ravaged neighborhood. On her first visit back, she said, she failed to recognize her own house. She said she knows she needs counseling, but life’s been too full of other decisions to seek it out. In a 2017 study published in JAMA Psychiatry, Galea and colleagues found that one way to address the psychological consequences of disaster is through “stepped care,” which screens survivors as they move through the recovery process, “so that you can direct them to the care they need, when they have that need,” said Galea. Providing regular mental health treatment — including practical approaches like cognitive behavior therapy — is one of two key steps to recovery. The other, Galea said, is through restoring a community’s social and economic functioning. Virtual town halls helped people displaced by the 2005 hurricane participate in the recovery, Peek said. “It was those moments of connection and the sense of cultural familiarity that sometimes made a big difference in terms of the emotional healing process,” she said. The Town of Paradise Facebook page seems to be filling that role. In addition to providing notices about building regulations, safety issues and where to get free drinking water, it’s acting as a public forum where people can participate in live planning meetings and discussions about the town’s future. Social worker Linnea Duncan is part of a group of therapists offering free treatment for Paradise residents. 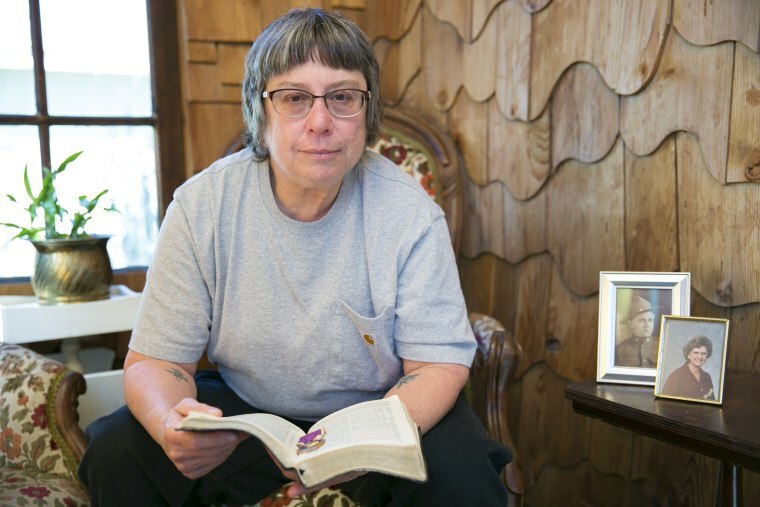 For Carol Holcomb, though, there will be no going home to Paradise. She is healing — getting treatment for PTSD symptoms and, thanks to a thoughtful person who put the backpack she’d left on the median back in her burned out truck, she recovered some of her family’s treasures.